Once upon a time a man went out into the woods, and before long, he was lost. Although he searched and searched, he could find nothing familiar — no trail, no sign of his village, nothing that could lead him home. The light was fading, and the day grew colder. When he came upon a cave, he decided to stay there for the night. He knew he would never find his way home in the dark. It happened that this cave belonged to a bear that was out in the forest when the man arrived. As the sun set, the bear returned, and when he walked through the entrance of his den, he saw the man. The man was alarmed, but in those days bears and humans could talk to each other, and the bear was not angry. When he saw the man was shivering with cold, he took pity on him. The man grew calm, for he saw kindness in the bear’s eyes, and he stayed there that night. 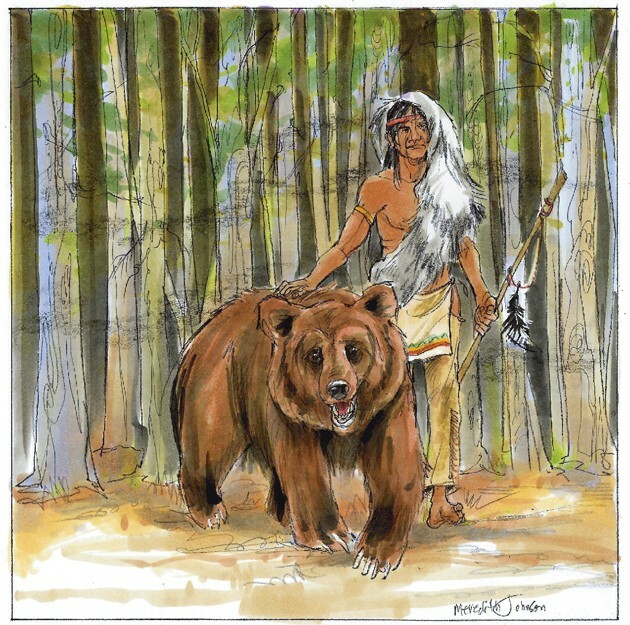 The bear led him out into the woods toward the river. When they reached the riverbank, he taught the man how to lean forward and drink from the river. As they walked through the forest, the bear taught the man many things. “I do,” said the man. “That is our breath. That is how you find us,” said the bear. That evening the bear and the man returned to the cave. The man decided to stay and learn all the lessons of the bear. Besides, winter was coming. The man agreed to stay the winter. When winter reached the halfway mark, the bear turned over on his side. He called to the man, “Turn over.” The man did as was told. After many months of sleep, one day the bear woke. “It is time to get up,” the bear said. The man woke, too. The man put his hand outside the cave. The air felt warm. “Touch the earth,” said the bear. The man did, and he knew the snow had melted. Together they left the cave and walked in the cool spring morning toward the edge of the forest. The man agreed, and they said farewell. The bear returned to the forest. The man walked to his village, where everyone greeted him with joy. When fall came again, the man went out with his fellow hunters to hunt for bear, but they were unsuccessful. The man seemed to have forgotten all the bear had taught him. The second time he went hunting, he decided he would go alone. As he walked through the forest, he began to remember. He looked for warm breath rising from the forest floor. When he saw the mist, he took aim with his arrow. That day he came home with a bear, and every day thereafter he always found bears. The hunter shook his head. “The Creator wishes me to keep my luck to myself,” he said. The others prodded and poked, trying to learn his ways. They teased him. They grew angry. But the man was faithful to his bear friend, and he always kept his secret as a way of giving thanks.